Sandy Springs: Patient Doctor disconnect on Dental Implants? There really is a disconnect between the doctor and patient. This comes as no surprise, since patients are thinking about how they are going to pay for the implants, and whether the procedure will be painful. It turns out that there’s a real difference between the questions dental implant patients ask — and which questions they should be asking. If you would like to learn more about implants, how much they cost and your candidacy, please call or email your question. We will try and answer your cost questions as well. Schedule a cost free analysis and meet our in-house periodontist, Dr. Will Zinney and myself, a prosthodontist. Studies show a link between breast cancer and dental health. After heart disease, breast cancer is the second leading cause of death among women in the United States. You may be 11 times more likely to develop breast cancer if you have poor oral health or periodontal disease. The Journal of Breast Cancer Research and Treatment conducted a survey of over 3,000 women and found that individuals with chronic periodontal disease had a higher occurrence of breast cancer. Given that about 1 in 8 women will develop breast cancer over the course of their lifetime, many women’s lives could be saved if breast cancer was diagnosed earlier, and early diagnosis could be achieved if there were more and easier opportunities to do so. The method of early diagnosis is not yet approved by the Food and Drug Administration, but researchers found that the protein levels in saliva have shown the potential to assist in the diagnosis, treatment, and follow-up care of breast cancer. Salivary testing has some real advantages over blood testing. The collection of saliva is safe, non-invasive, and collectable without causing a patient any pain or discomfort. Dentists would be the appropriate health care provider to take periodic saliva samples during regularly scheduled visits. Properly integrated into the examination process, this would aid patients and physicians before, during, and after diagnosis and treatment of breast cancer. The use of saliva testing would be an annual adjunct bench mark in women’s annual health care. Patients would still need to undergo routine breast cancer exams, including mammography and blood tests, but there should be a greater chance of early detection with the use of all of these screening tests. Given the links, good oral health care is very important to your global health care. If we can be of service or answer any of your questions feel free to contact us. In 2011, an estimated 230,480 new cases of invasive breast cancer were expected to be diagnosed in women in the U.S., along with 57,650 new cases of non-invasive breast cancer, with almost 40,000 deaths in 2011 alone. Research shows there is an increased prevalence of gum disease among those patients with diabetes. And yet with only 600 calories of non-starchy vegetables per day a patient may rid themselves of a life of chronic health issues. According to Newcastle University in a groundbreaking British study, patients who consumed only 600 calories a day for two months were able to reverse their Type 2 diabetes. The research, involving only 11 patients, suggests a very low-calorie diet can remove fat that clogs the pancreas, allowing normal insulin secretion to be restored. Seven of the 11 patients remained free of diabetes three months after the study. Type 2 diabetes, also known as adult-onset diabetes, occurs when the pancreas is unable to produce sufficient insulin to regulate fat metabolism and sugars in the blood, or when the body is unable to react to the insulin. Insulin is needed to move blood sugar (glucose) into cells, where it is stored and later used for energy. When sugar cannot enter cells, abnormally high levels of sugar build up in the blood. This is called hyperglycemia. The study that was announced at an American Diabetes Association conference is being published in the journal Diabetologia. Over eight weeks, researchers monitored the fat content in the liver and the insulin production from the pancreas, comparing the results to a control group of non-diabetics. After only one week, the diabetics’ pre-breakfast blood sugar levels were normal. According to NU researchers, MRI scans of the patients’ pancreases revealed that fat levels had dropped, which allowed the organ to produce more insulin. While the trial sample is very small, the potential discovery is huge. Generally, diabetic patients require additional oral maintenance. So if you reverse the diabetes, you can reverse your oral health issues that result from it. It’s food for thought. American Diabetes Association. Diagnosis and classification of diabetes mellitus. Diabetes Care. 2010;33 Suppl 1:S62-S69. Ari S. Eckman, MD, Division of Endocrinology and Metabolism, Johns Hopkins School of Medicine, Baltimore, MD. Review provided by VeriMed Healthcare Network. Also reviewed by David Zieve, MD, MHA, Medical Director, A.D.A.M., Inc.
Buckhead Dentist: We’ve made progress. • Bee: Honey, a product of bees, was used to coat an infected tooth in the Middle Ages. 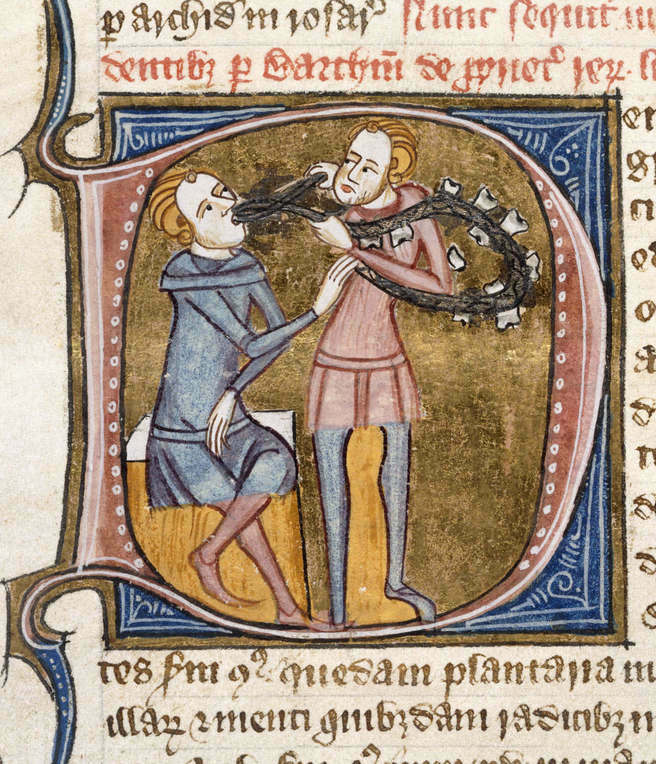 People smeared their aching teeth with honey and waited all night with tweezers in hand, ready to pluck out the toothworm. The bait rarely worked. • Donkey: In ancient Greece, donkey’s milk was used as a mouthwash to strengthen the gums and teeth. It was obvious goats milk did not have the same medicinal attributes. • Frog: Besides spitting in a frog’s mouth for toothache relief, these web-footed creatures were applied to a person’s cheek or to the head on the side of the ailing tooth. The worst case scenario is you ended up with a prince or princess. • Onion: In the Middle Ages a slice of onion was applied to the ear on the side of the aching tooth. Obviously, they had never heard the old adage that ‘misery loves company’, because no friends wanted to hang around people with smelly onion ears. If you are having a persisting or intermittent ache in your tooth for a prolonged period of time and none of these remedies are working for you, you mostly likely need to see your dentist. Portions were Reprinted with permission from “Toothworms and Spider Juice: An Illustrated History of Dentistry” – Loretta Frances Ichord, Millerbrook Press. A recent study at Rutgers University, and published in Phytochemistry, confirmed a long-held theory that ingestion of cranberries is helpful in protecting against harmful bacterial in the urinary tract. This is due to one of its natural compounds called proanthocyanidin [PAC’s], and its anti-adhesion effect. Cranberry components are potential anti-caries agents since they inhibit acid production, attachment, and biofilm formation by Streptococcus mutans. The anti-adhesion property of cranberries prevents bacteria from sticking to the urinary tract, which is one of the most common regions for a woman to develop a bacterial infection. There is some conjecture that PAC’s found in cranberry may minimize stomach ulcers and gum disease by the same mechanism. Regarding periodontal diseases, the same cranberry fraction inhibits host inflammatory responses, production, and activity of enzymes that cause the destruction of the extracellular matrix, biofilm formation, and adherence of Porphyromonas gingivalis, and proteolytic activities and coaggregation of periodontopathogens. The study concluded that 80% of the antibiotic-resistant bacteria were prevented from sticking by the anti-adhesion property of cranberries. This study compared the action of PAC’s in cranberries to those in other foods such as grape and apple juice, dark chocolate and green tea. Apparently, not all PAC-rich foods have the same success or offer the same protection. By means of comparison, one eight-ounce glass of cranberry juice has the equivalent PAC’s as a cup of frozen or fresh cranberries, 1/3 cup of sweetened dried cranberries or 1/3 cup of cranberry sauce. Both this study and earlier research show that the benefits of one glass of cranberry juice kicks in about two hours after consumption and lasts for about 10 hours. So, it is recommended that you drink one glass of cranberry juice in the morning and one in the evening for the maximum protection. 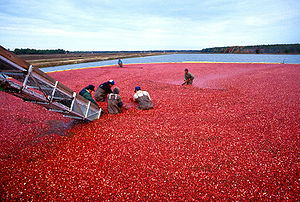 Remember, cranberry is a food and not a treatment. Keep in mind that anyone who suspects an infection should consult the appropriate health care practitioner. Considered a “super-fruit,” the strawberry is rich in antioxidants and extremely beneficial to heart health. Low in calories but high in vitamin C, potassium, fiber and folic acid, strawberries are a tasty part of a healthy diet — but too much of a good thing can be bad for your teeth. Unfortunately, strawberries, like many healthy foods, are highly acidic — and consuming acidic foods and drinks on an ongoing basis can lead tooth erosion, a condition that wears down the protective coating of enamel on your teeth. Once tooth enamel is lost, it doesn’t grow back. Enamel erosion can cause a wide range of dental problems, including sensitive teeth, discoloration, cracked teeth and even tooth loss. 1. Eat smart. Pair your strawberries with foods that have low acid and sugar content. Nuts, spinach, bananas, apples and many dairy products are excellent options. 2. Don’t eat constantly throughout the day. Waiting a couple of hours between servings allows saliva to neutralize acid and repair tooth enamel. 3. Rinse after eating. Rinsing your mouth out with water also neutralizes acid. 4. Chew gum. Chewing sugar-free gum for 20 minutes following a meal can activate saliva and help wash away debris. 5. Hold off on brushing your teeth. Yes, you read that right! The abrasives in toothpaste can further damage enamel that’s weakened by acid. Wait at least 30 minutes before brushing your teeth after eating or drinking something acidic. 6. Floss. 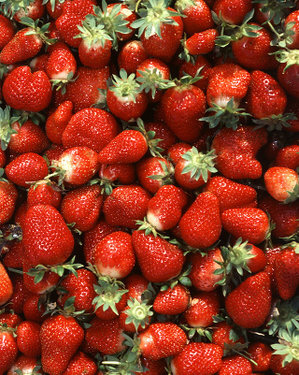 Strawberries contain an average of 200 seeds, which can get stuck in your teeth. Flossing at least once a day will help you prevent cavities from developing between teeth. When it comes to the many health benefits of strawberries, your teeth are probably the last thing on your mind. But with a little forethought, you can fully enjoy your favorite fruit without worrying about your dental health. Oral Surgeons, Periodontists, and the least known, Prosthodontists (who generally orchestrate the placement and final restoration of the implant). Prosthodontics has a dental specialty license pertaining to the diagnosis, treatment planning, rehabilitation and maintenance of the oral function, comfort, appearance and health of patients with clinical conditions associated with missing or deficient teeth and/or oral and maxillofacial tissues using biocompatible substitutes. Most dentists are not trained prosthodontic graduates of a dental school – rather they take short continuing education and utilize trial and error experience to be able to understand how size, shape, color and symmetry all work together to create what a prosthodontist is trained in their post graduate work. 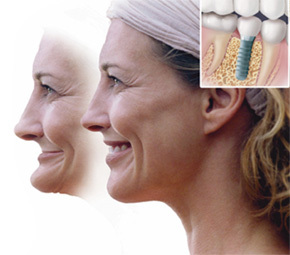 Contrary to this hit or miss self-anointment, the prosthodontist is trained at an ADA approved university to create the smile that implements the use of dental implants to ensure that the right smile is achieved, both functionally and aesthetically. If anyone has a specialty in implant dentistry or the right to call themselves an ‘implantologist’, it would be the ADA sanctioned prosthodontist. Of the 170 thousand dentists in the U.S., less than two (2%) percent are trained prosthodontists. So when you are seriously looking for a cosmetic dentist to provide you with the best implant result, look for a prosthodontist. Dr. Scheinfeld received her prosthodontics degree from Emory University School of Dentistry in 1988. Her prosthodontics’ instructor Dr. E. Neal Kopp practiced with her for 14 years until his death in 2008. In addition, Dr. Sidney Tourial, an adjunct Emory Prosthodontic professor and next year’s GDA President has been in the practice for over 19 years.